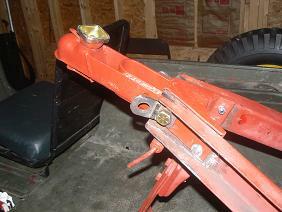 Quote Reply Topic: Modern Fulton Hitch Replacement? I am going to be using my cover bantam soon and the hitch on it is a farmers special. I wanted to use and original hitch but they are hard to find. So I started searching around and found the fulton website, there seems to be a modern replacement or close looking replacement for the original hitch. 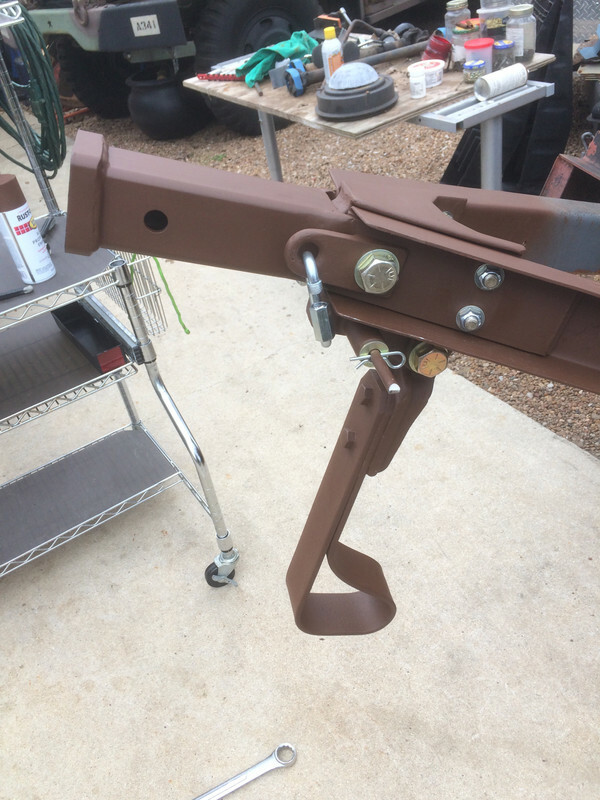 Has anyone used the fulton 308 hitch on their trailer before? Here are some links. I haven't used one of those, but it sure looks closer than any modern replacement. Looking at the pictures, it appears that there is a plate welded to the bottom of the "legs" (tough to see for sure from the angles) so part of that plate would have to be cut off to allow the back part of the "legs" to be angled to match the shape of the drawbar casting. I found a better picture, it looks like with a some work it should be ok. I am going to get one and find out. If you need particular pictures of an original let me know, mine is currently setting on the shelf so I can get pretty much any angle you need. There's also Titan - DICO couplers, as well. These knobs are a little closer to the correct shape. I just bought that same Fulton hitch. Previous owner had cut the original. Mine appears to be the type that had the strap steel connection. Looks as if I will need to cut out the botton of the new hitch to get it to go on either side of the new strap I have to make. 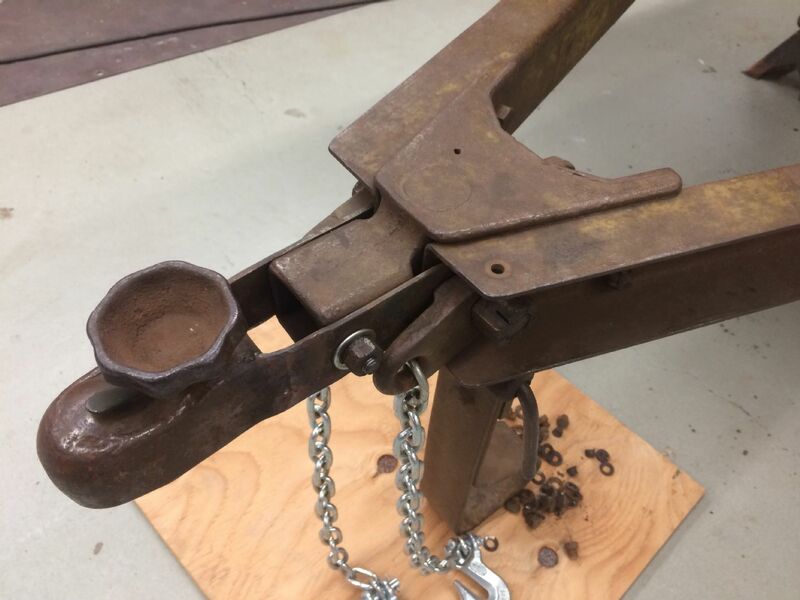 What mine should have looked like, an original pic I found, and my attemp with the fulton hitch pictured in an earlier post. We cut the bottom sectionout to look more like orginal. The Fulton #308 (not the rental market part) is the closest you will find to the original Fulton 1 7/8" coupler. All it takes is some cutting and bending, in locations obvious when you compare close ups of the parts, and you will have something that looks almost original. The original Fulton couplers mounted on Bantams appear to be the 1940s version of the same part, modified to fit by Bantam. The knob won't be correct, but you may find an original knob someday, which I believe can easily be made to fit the modern part. I came across this online. It's an O-8 but the box states that it replaces the 0-6. I thought it was interesting that it came with a 1-7/8" ball also. I also have a round tube Fulton coupler, similar to the one that you found Dave. 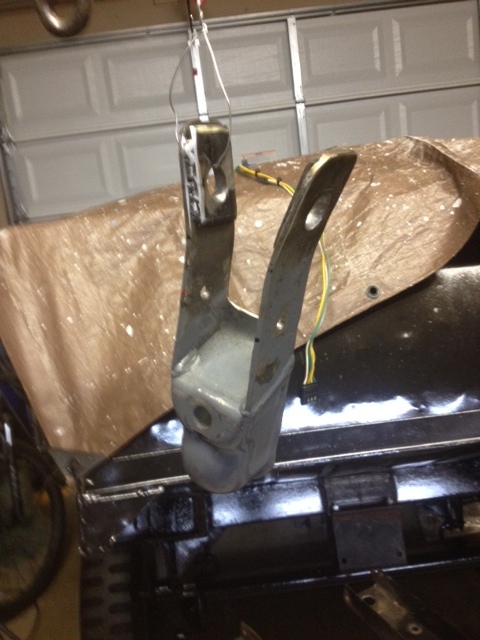 Even though they are close in appearance to the Bantam Fultons, the mounting tabs on my round tube Fulton are too short to properly fit over the Bantam hitch casting without lengthening them so that they can reach the safety chain bolt...at least on my '46 they were. What is the length of the mounting tabs on your model?...Just a wild guess, but I was curious if O-6 meant 6 inch long mount tabs, and O-8 meant 8 inch long mount tabs??? Also, the later square shaped hand wheel parts on my version of the round tube Fulton, do not fit the well in the early Fulton used on the Bantams, due to the diameter of the bolt threads and the size of the stamped ball retainer piece that the bolt goes through. Which diameter bolt does your coupler use? Lastly, are there any markings on the hitch ball? Sorry for all the questions, and thanks for the pictures! It is a little shorter when I lined up the bolt holes, as you can see, compared to an original. It looks like it would work with a little hammering. I plan to use the original though. The ball is only marked 1 7/8 on the top, no other markings. I've got the later casting with the full square block up front. Here's what you need to do for the Fulton #308 to fit and look as close to original as possible on that full "cast" casting. Since this one is for a 2" ball, it is a little wider than the original. Like what was said before, you have to cut out most of the existing bottom. You also have to bend out the newly created arms to fit the A-frame of the trailer. Since it is a little wider than original, I added plates to take up the gap. 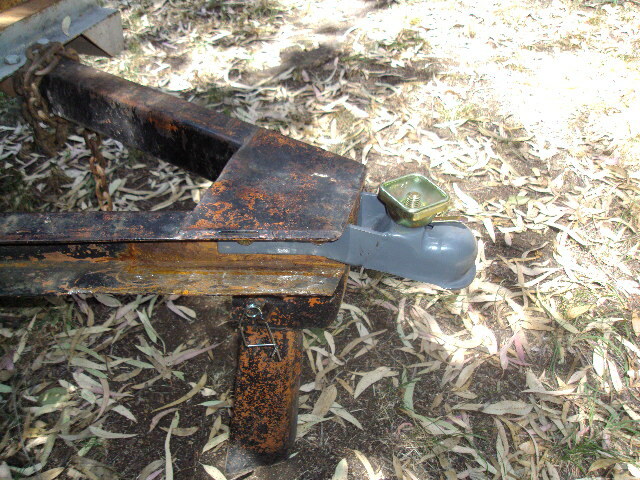 If you have a press, you could probably get creative so it would sit flush with the casting and A-frame and not use plates....All is have is a BFH and a vise. You could also just use washers. 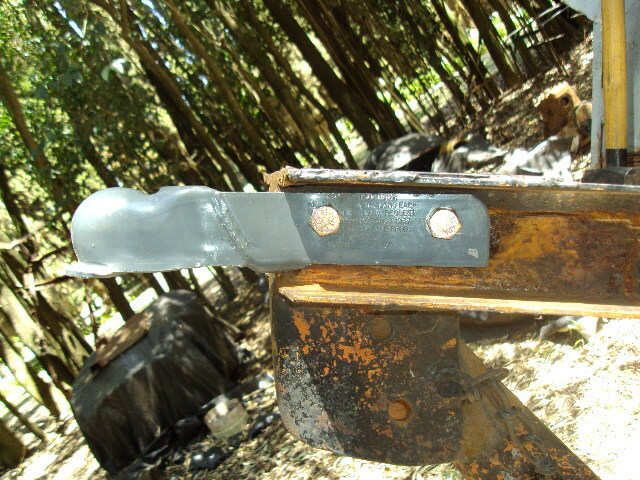 I thought the welded plates would make a better mating surface and be more stable. 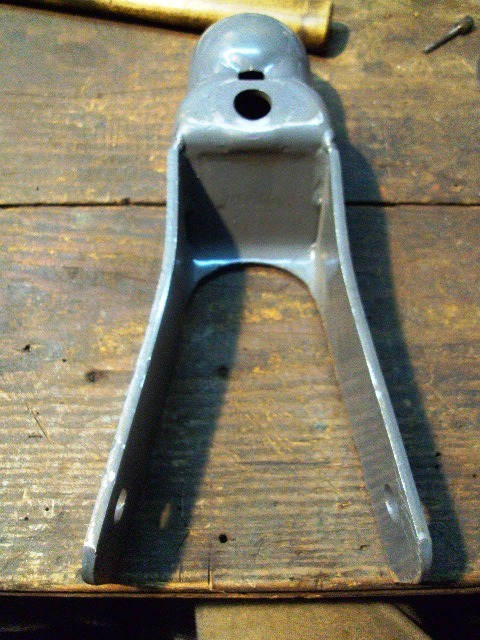 I originally had plates on the forward portion as well for the forward bolt that goes through the casting, but the whole hitch wouldn't go on because the forward "block" portion of the casting is wider than the pinnacle of the A-frame. I may use washers there, but I don't think it's necessary. That forward bolt just keeps the hitch from moving up and down. I'll post some pics when it's all mounted up for those who follow this trail in the future. 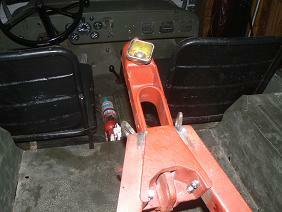 BTW, drilling/cutting an angled hole that big for the rear bolt.....was hard. Did you ever mount this coupler? I'd like to see photos of how it turned out. Thanks! Ok, I've had a HUGE hiatus from old jeep stuff, but I have had some movement on my trailer since 2013. I did mount it up after my previous post and have used it constantly since 2013 for numerous camping trips with the family and as Cubmaster in the Cubscouts. I have come to learn something about this hitch setup....it is way too dang short! This trailer needs about another foot of front tang. Backing this thing up with my truck is impossible and I jack-knifed it back in 2015 with my 2012 JKU and knocked out the tail light because I couldn't see it after it already got squirrely. Anyway, I had it painted and color match bed-lined to match my CJ5. 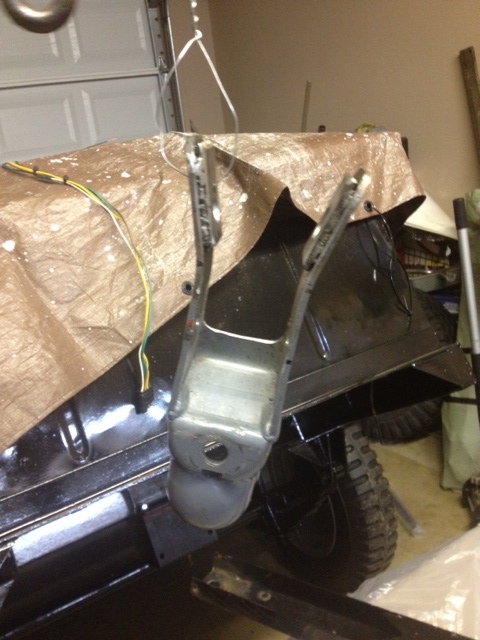 I'll post up some pics of the hitch setup. I'm looking forward to seeing the pics of your hitch setup. 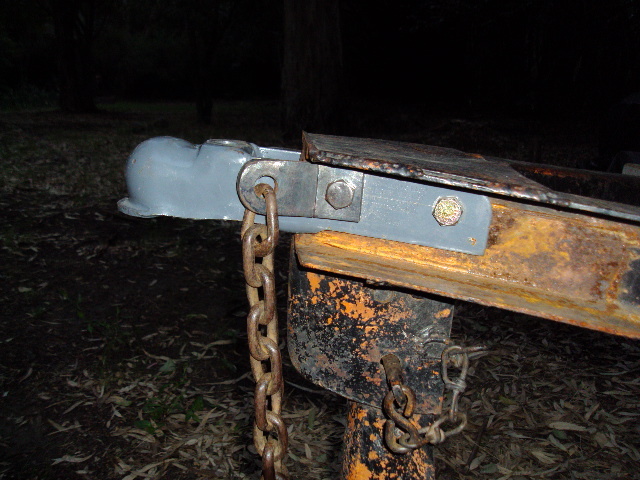 I've got an original Fulton 06 hitch on my trailer but it is fussy to use- lots of fiddling to get it tight on the ball and I have to use a wrench to hold the nut while it is tightened or loosened which is a pain. Once it's on it's fine. I'm thinking of switching it out for ease of use and to save the original hitch from wear and tear since it can't be replaced. I also would like a longer tongue from time to time. I agree it is hard to back up these trailers with a truck since you can't see it until it's too late. You really need a spotter. I have learned that very small steering corrections go a long way. Anyway, my thinking is that I can make a receiver tube to fit over the drawbar casting which has a section that sticks out from the drawbars. 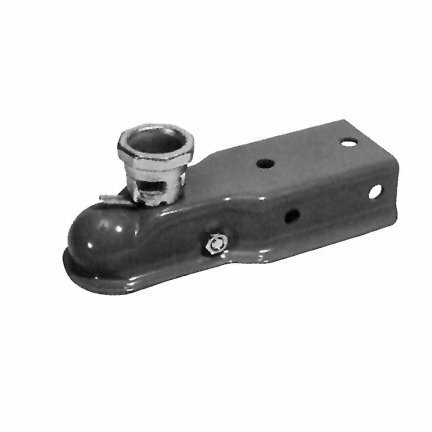 The receiver tube would bolt to the casting and the drawbars just like the Fulton coupler does. This would allow a longer tongue bar to be added when I want it. I've seen one done like that (posted a pic below).